We departed Lake Pleasant (Seattle area) this AM heading south. Quick stop at Freightliner to have a couple issues checked. Whew, no problems. 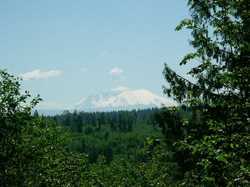 Now in Chehalis, WA, just 30 mi south of Olympia, at the Thousand Trails Preserve. Absolutely beautiful; old forest, ferns, wildlife. So many trees, no DirecTV. Like a rain forest and wet, wet, wet. Here until Monday then south into Oregon. Maybe we can get out of the rain soon!